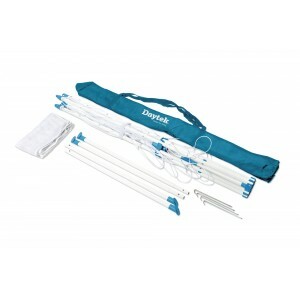 Dry anywhere, indoor, outdoor, at home or away camping, the Daytek Porta-Line is a versatile portable clothesline/airer with up to 25m of hanging space. Easy to assembly and easy to fold away, the Daytek Porta-Line includes a storage/carry bag perfect for taking on camping trips or weekends away. The included 4 x steel ground pegs for outdoor use will ensure the unit won’t topple over during unexpected gusts of wind.